December is the cruellest month of the year. For miles and miles, nothing except an endless carpet of snow…which greets the eye. The hills, the dales, the vudar, the house tops, the leafless willow, the chinar and at times even the streaming river are draped in downy snow. The sky is lifeless without the bulbul, the koel and the brags winging across its length and breadth. So are the khal khal and the khah. Fastened doors hold life within. All huddled around the bukhari or clinging to the kangri precariously placed between the feet holding fast the hem of the pheran. As night approaches, the eerie stillness deepens. For ages, parents in Kashmir have scared unruly children with the invocation of the name of brahmrochoke, a mighty one-eyed demon, forever wandering in the desolate snow-clad fields. With electric lights often playing truant, Kashmiris have their meals in the wee hours of the light and then retire to bed in the comforting light of storm lantern. The only sound that rips the silence of the night is the occasional thunder and the howling of the blizzard. Otherwise, life stands still both within and without. The tourist who comes for a few days exults at the sight of snow. He frolics in snow and marvels at the beauty of the snowflakes falling soundlessly on the wide and buxom bosom of mother earth. The only other creatures delighting in snow are the boys and girls who spend hours sculpting new images out of the fallen snow. Some others fight mock battles with the broken pieces of til kutur hanging off the edges of the rooftops. All the while, the women of the house slog in the kitchen or outdoor to fetch water from the neighbourhood nag or provisions from the neighbourhood shop. The men find going tough, especially if they have to run an errand some miles off. Trudging in the snow up and down the hillocks with a load on your back can be extremely precarious. Yet, life has to be lived. With this feeling of resignation to an all powerful and all humbling fate, the adult Kashmiri comes to terms with December, the cruellest month of the year. 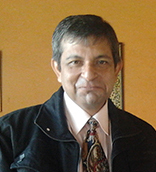 Ravi Dhar hails from a village in Kashmir, India. Widely travelled in India, South East Asia, Ethiopia and in Sweden, he holds a doctoral degree in English Literature. Published as a poet in several English Literary journals, he believes in the ceaseless quest for Truth as the cornerstone of all art. 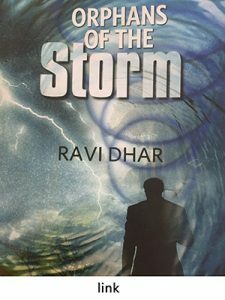 Orphans of the Storm is his debut novel. As the first book in the Kashmir Trilogy he plans to come out with, it looks forward to the evolution of Siddhartha in the later texts as The Man with the Mission of Peace and Mutual Understanding.